1 Phase, 4 kVA AC Power Source, CE Listed. 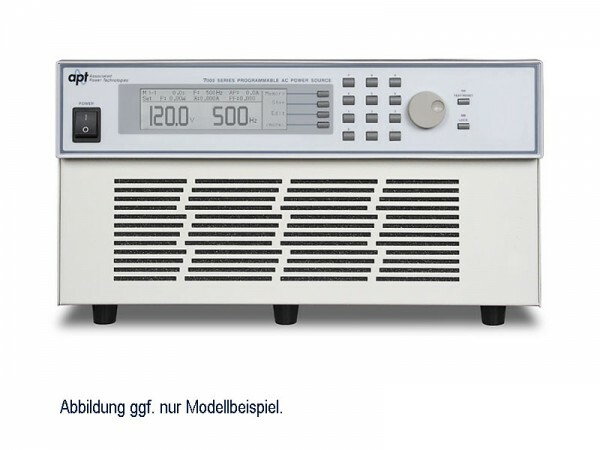 Produktinformationen "APT: 7040 Automated AC Power Source"
Our 7000 Series automated AC power sources are ideal for advanced applications at competitive prices. Switch-mode technology and a direct coupled output make these sources light weight and efficient for use on the bench-top or in a rack mount. The graphic LCD display provides real-time data on the front panel and the easy-to-use local interface allows operators to get tests up and running quickly. Use the rotary knob to adjust voltage or frequency during testing, adjust the starting or ending phase angle of the output waveform, and simulate the effect of voltage surges and drops on your DUT for transient testing. Weiterführende Links zu "APT: 7040 Automated AC Power Source"